Aluminum truss Trade Show Display & Trade Show Exhibit Booths. Truss, trussing and truss systems and structures. Welcome to Exhibit and Display Truss. We stock 100's of standard size exhibit structures in several profiles and sizes. Please contact us if you can not find the truss system you are looking for, as we can custom configure any shape or size you need at no extra cost. Our service and selection is second to none. Be sure to visit our You Tube Channel with lots of informative videos on our aluminum truss display products and custom fabrication services. Exhibits and Display Truss offers 10" truss, 12" truss and 6" truss to fabricate exciting and cost effective exhibit booths and display structures for your trade show display. In addition to our 10' X 10' truss systems, we offer an unmatched selection of custom trusses and exhibit booth accessories. Our 10' X 20' truss booths offer a medium sized display for your trade shows with a wide selection of truss designs. Our aluminum truss systems are perfect for trade show displays and can be decorated with our many booth accessories including flat screen LCD and Plasma televisions and more. Aluminum Truss Trade Show Exhibit Booths, Trusses and Kiosks custom designed and ready to ship off the shelf. Our 20' x 20' truss designs are large enough for any trade show display. Choose from one of our many truss designs or let us make you a custom truss structure. Aluminum Truss Trade Show Exhibit Booths, Trusses and Kiosks Custom designed and ready to ship off the shelf. We offer 4 different sizes of truss to fabricate exciting and cost effective exhibit booths and exhibit structures for your trade show display as well as amazing portable finish line and starting line structures and systems. 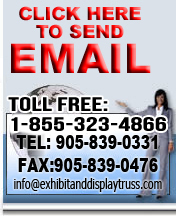 Including an unmatched selection of individual trusses and exhibit booth accessories. 10", 12" and 6" truss in flat truss, triangle truss and box truss or square truss. Aluminum Truss Exhibits for Trade Shows and Displays - Our illustrated 3D renderings of the most popular, cost effective and exciting exhibit designs make it fast and easy for you to shop for trade show displays and truss structures. You can customize your own solution from our wide selection of trade show displays and exhibit booths. We offer a huge range of aluminum truss structures for trade show displays and exhibits by selecting from a wide variety of stock and custom corners and truss lengths to create exciting truss system structures that stand out in a crowd. The high tech look of our aluminum truss is a popular choice these days but creating a cost effective and versatile display is often a huge effort. At Exhibit and Display Truss.com we have put together our most popular designs and layouts and packaged them up so you can make an informed well thought out selection that will suit your needs and budget with the click of your mouse. If you can't find the portable truss you're looking for, we can design and fabricate almost any truss structure you need by simply sending us a sketch and giving us some details on your situation and ideas. Our service is second to none and your satisfaction is always guaranteed. Your Custom Trade Show Exhibit Truss Display is Ready to Ship Today! For all your aluminum truss and stage lighting needs.